Detroit, Motown and Motor City history, The Henry Ford, Diego Rivera at the Detroit Institute of Arts, Lionel Trains, Hell, Battle Creek, Traverse City cherries, Mackinac Island and Mays fudge creations, Upper Peninsula, Sault St. Marie, Copper Harbor, waterfalls and sleeping Bear Dunes National Park. 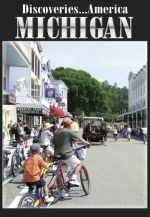 It�s all about water in Michigan�a large and magnificent state that is bordered on multiple sides by three Great Lakes � Michigan, Superior and Huron. Outdoor recreation takes place on snow and ice in the winter, and on the water in the summer. Detroit, aka the �motor city� is famous as the birthplace of the automobile. The MotorCities Automobile Heritage Area contains a number of historical sites and museums dedicating to preserving the region�s importance as the historical center of the automobile industry. The Detroit Institute of Art is home to the Detroit Industry Murals, created by Diego Rivera in 1933. These murals capture the essence of the early automobile industry with remarkable clarity and passion. The Henry Ford is a combination of venues including historic Greenfield Village and Thomas Edison�s original Menlo Park laboratory. On exhibition, one of the phonographs used to make the recording of the human voice. The road to Hell, Michigan is paved with good intentions. The residents of this small town exhibit a great sense of humor about their town�s name and welcome all persons on their journey through Hell. Travelers can visit Scream�s Ice Cream, shop in a year round Halloween store or go to the post office and mail their �taxes from Hell�. For more than 100 years Lionel trains have been delighting kids of all ages. The new visitor�s center displays four different model train layouts with as many as 20 trains running at once. It�s a place where anyone can be a train engineer for a day and learn about the different model trains produced by the company. Cherries are an important crop raised in Northern Michigan and the annual Cherry Festival in Traverse City is a great place to spend the fourth of July. Along the lakeshore, giant sand dunes rise up from the water, creating a stunning location for hiking, water sports and a variety of outdoor recreation vehicles. What does it take to be a Master Bladesmith? Doug Noren would know. Every day he fires up the forge and brings hot metal to the anvil, melting, hammering, grinding and polishing�creating beautiful blades for exhibition and collection around the country. The Upper Peninsula is a wonderland of wilderness and waterfalls. The region�s colorful locations include Tahquamanon Falls, Copper Harbor and the Sault Locks where giant ore boats traverse the impassable St. Mary�s Falls. Mackinac Island is the jewel of the state. Automobiles are not allowed to intrude on the natural beauty of the island so transportation is by horse, bicycle or on foot. One of the best ways to see the historic sites is by horse drawn carriage. Visitors can watch live demonstrations at Fort Mackinac, which was created by British soldiers during the American Revolution, or experience the old world hospitality of the Grand Hotel.